Dynamic and smooth describe the memorable melodies that emit from the saxophone of Edgar Wallace Jr.
A mixture of modern jazz, and “I need to get up and groove” rhythms provide the foundation for Edgar's current project. The musical journey begins with a hot “Single” release of a cover tune by Darryl Hall & John Oates entitled “I Can’t Go For That” along with a smoking music video. Modern synth sounds, lush background vocals, and pop beats intertwine with the vocal like quality of Edgar’s Alto sax on this track. 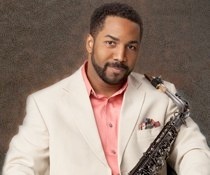 Saxophonist Edgar Wallace Jr. is from the Metropolitan Detroit, Michigan area. He’s also a writer, producer, commercial print model, actor and music video director. Edgar is known by his peers as being a real techie in computer music technology, which led him to recording and producing most of his music in his computer based studio. This technology allows him the time and freedom to compose quality songs that he's passionate about and that his fans will appreciate and love. Edgar has performed as a lead instrumentalist for various corporate and public events throughout the country; among those events were concert openings for Earth Wind & Fire, Najee, Roy Ayers, David Benoit, Jean Lucponty, Russ Freeman and The Rippingtons to name a few. Edgar’s previous nationally distributed c.d. entitled “On The Beach” was self-produced and written. It is available on iTunes as well other digital outlets.